The Nabtesco Group is fostering the activities to reduce landfill waste to zero based on the approach of 3Rs (reduce, reuse, recycle)—the basic practice for establishing a resource-circulating society—for all types of emissions generated in the course of our business. In FY2017 we continued to implement the separation of waste bound for landfill and enhanced waste heat recovery processes, thus achieving a 44% reduction from the previous fiscal year. The Zero Emission rate was 0.06%, exceeding the FY2017 target rate of 0.1% or below. 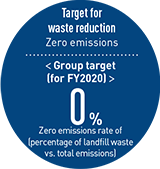 This year we will continue to promote the 3Rs in order to achieve the Zero Emissions goal of 0%* by FY2020. The Nabtesco Group landfills metals, waste plastics, and waste glass that do not contain hazardous substances. * The figure for the Nabtesco Group in FY2015 was calculated with the scope of the survey being the 12 months from January to December 2015.
oil, sludge, wood, liquid, plastic, etc. packaging, general waste, plastic, etc. The Nabtesco Group was landfilling 0.1 ton per year of waste alkalis, which are hazardous, until FY2014. In FY2015, however, we began to detoxify alkalis, water-soluble waste oil, and other hazardous waste prior to their disposal. Accordingly, we have not released any waste containing hazardous substances since FY2015. By reusing components and reducing the production of new ones, Nabtesco is working to minimize the use of resources. We have been fostering the MRO (maintenance, repair, and overhaul) business to optimized the use of resources and expand sales in the service field. The Nabtesco Group is working to identify, reduce the use, and prevent the leakage of substances that impact the environment as a result of its business operations. High concentration PCB equipment: Stored at Gifu Plant, Tarui Plant and Konan Plant. Waiting for acceptance by a designated disposal business operator (JESCO). * Errors were found in the calculations of direct VOC emissions from domestic Group companies in FY2015 and FY2016. Accordingly, the figure for FY2015 was corrected from 37.8 tons to 39.0 tons, and that for FY2016, from 42.8 tons to 44.0 tons. The Nabtesco Group does not require a large amount of water nor water of a certain quality for its business operations. However, we deem it important to manage water resources, and accordingly conduct water-related risk analyses, measure the amount of water used and discharged, monitor water quality, and implement measures to prevent the leakage of hazardous substances into water. The Nabtesco Group has the following targets for the use of water and management of water quality. The amount of water used and discharged at each base are measured every month, and the Group data are accumulated through the environmental information management tool. As for bases where the amount of water per month fluctuates greatly, we conduct surveys to identify contributing factors for the increased water usage, and implement measures to reduce the water use as necessary. As for water quality control, we continuously monitor through monthly voluntary tests and regular inspections by external experts. * Set criteria that are stricter than local standards, and monitor and manage the discharge of water. In 2012 the Nabtesco Group started to manage its water consumption on a global level *1 *2 *3, including the data for the overseas Group companies. The water consumption at the overseas Group companies remains relatively low, constituting a mere 10% of the Group consumption; however, in order to respond to global water risks, we continue managing the water consumption in our overseas operations. In addition, while we used to manage the amount of water discharged only for Group companies in Japan, we commenced water discharge management on a global basis by including overseas Group companies in FY2016. *2 The calculation period for Nabtesco Corporation and domestic Group companies is from January to December 2017. *3 To ensure data credibility, all data received the third-party verification from Lloyd Register Quality Assurance Limited. The Nabtesco Group in Japan uses groundwater mainly to cool test stands and melt snow in snowy regions (Yamagata and Gifu). We discharge the used groundwater to rivers under the strict water quality control criteria set by the Group. In FY2017, there were no cases wherein used groundwater did not meet the water quality control criteria. The total volume of water used by the Nabtesco Group in FY2017 amounted to 710,000m3, an increase of 7.3% (48,000m3) compared to the previous fiscal year. The major contributor to this increase was an expansion in production volumes at Tarui Plant (which supplies hydraulic equipment for construction machinery) on the back of the rebound of demand for construction machinery in the Chinese market. The increased production volumes resulted in longer operation hours for test stands. Due to heavy rain falls caused by recent climate change, the risk of rainwater flooding our plants is increasing. The Nabtesco Group uses oil-based type and water-soluble type cutting fluids in its business operations and recognizes the risk of hazardous substances contained in these cutting fluids discharged to rivers if rainwater floods the manufacturing facilities. To prevent this, we have been making capital expenditure to install oil-water separation tanks and oil recovery equipment. In FY2017, we spent around 0.5 million yen to enhance the rainwater discharging function, install drainage pipes, and make our facilities more water-resistant. In FY2014, water-related risks in the areas where the Nabtesco Group’s seven plants (Yamagata, Gifu, Tarui, Tsu, Kobe, Seishin, and Konan Plants) are located were evaluated using the Aqueduct tool provided by the World Resources Institute and referencing the “water vision” announced by the local municipalities. We later increased the number of subject plants and evaluate them every year. The evaluation results confirmed that our Group has low water-related risks. We also began a similar evaluation of our overseas plants in FY2016. In FY2017, we assessed water-related risks in areas in China and Thailand in which we have plants (eight plants in China and two in Thailand) that use water during the production process. As a result, we confirmed that our plant in the Beijing area in China has a high water-related risk. Because risks related to regulations and reputations in the local area are the major concerns, we will control such risks through ESH audits and monitoring of laws and regulations. In China, we also confirmed risks related to water quality. However, we concluded that water-related risks were low on the whole in light of the low impact of water quality on our production. To reduce water use, the Nabtesco Group has since FY2014 been replying to the CDP Water*4 questionnaire in collaboration with external organizations. Furthermore, from the perspective of harmony with local communities, we proactively participate in the local environment/water-related councils, implement water conservation activities and exchange opinions. * 4 CDP Water: CDP’s survey program to find each company’s risk awareness and the strategies against the water risks.